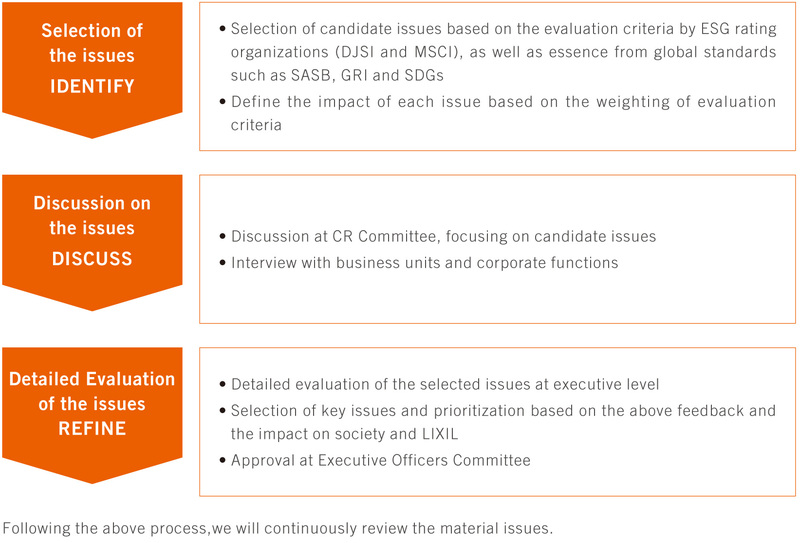 The Issues outlined in our corporate responsibility (CR) strategy and framework are based on a rigorous materiality selection process, as described below, which enables us to identify the issues that matter the most to our stakeholders and our Group. We have set medium-term action plans focusing on each of these material issues, and will be disclosing the progress and results of related activities on this website. Corporate governance* As a global company, maintaining strong corporate governance practices is of critical importance to LIXIL. It is also an issue that has become of increased interest to our shareholders with the adoption of Japan’s Corporate Governance Code in 2015. Human rights due diligence* With the UN’s adoption of Guiding Principles on Business and Human Rights clarifying the responsibility of companies to uphold human rights, protecting and respecting human rights both within the LIXIL Group and across its entire sphere of business influence have become a greater priority. Supply chain management* Stakeholder interest in responsible supplier management has grown in line with the development of international standards on sustainable procurement. The LIXIL Group’s manufacturing footprint expands across Japan, Asia, as well as, Europe, North and South America, and the Middle East, and we need to do more to promote responsible supplier management.